Windows XP released in 2001 to much fanfare. It was quickly adopted by users all around the world and quickly dominated the market share of operating systems which until that time had been dominated by Windows 95. That was twelve years ago. Since then Microsoft has released Windows Vista, Windows 7, and recently Windows 8. Windows 7 has also only recently passed Windows XP as the predominant operating system in use. As the saying goes, all good things come to an end, and Microsoft has set a sunset date for XP after which time they won’t provide any more support. However, there are still a lot of people who do continue to run Windows XP. Have a look at the graph below. 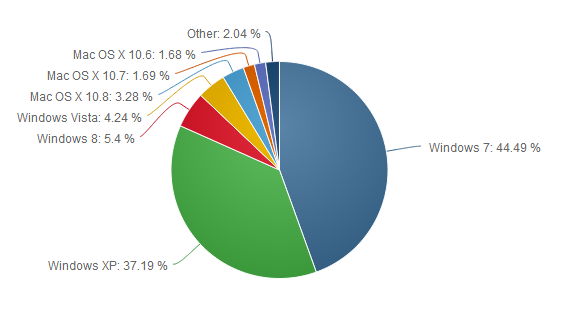 This data, from Net Market Share reveals that Windows XP with 37% share is only just surpassed by Windows 7 in market share. Microsoft has estimated that there are currently 1.5 billion Windows users. This means that there are over 500 million users working on Windows XP. It’s a good bet that many, if not most, of these 500 million users are businesses, and probably SMEs with small IT budgets. As for how many of these are Australian businesses, well that’s anyone’s guess; I’d hazard that a lot of Aussie businesses run on XP computers. This means that many Australian businesses will face some severe computer security risks in the coming years. Why Do I Need To Upgrade Anyway? Well, strictly speaking, you don’t. Not if your computer still does what you want to use it for, and does it efficiently. You can keep using Windows XP until your PC shuffles of its mortal coil. XP doesn’t have a kill switch that can be turned off by Microsoft. It will work as long as it has a compatible computer to work on. But, you’ll be missing out on some valuable security upgrades that close the holes in your computers operating system and keep out some bad guys who simply want to ruin your day. If you only browse the web, play a few games, and back up your photos and documents, and don’t use your computer to access bank and other accounts. It probably doesn’t matter too much if you keep using it. On the other hand, it’s still a better choice to upgrade, and for this kind of computer usage, it’s an easy upgrade. If you use your computer to do banking, keep your business accounts and documents, and generally run your business on, then it’s in your interest to upgrade. The cost of upgrading pales in comparison to the cost of recovering all your data, changing your passwords because someone in Russia now has them, and not to mention the stress you’ll be facing. Your business should also have a hardware upgrade plan in place because your computers aren’t going to last forever. It’s always better to plan to change your hardware, than wait for it to fail and then yell, “help!” This plan should also take into account upgrades to the applications you use, such as Office, and of course new versions of operating systems. The easiest suggestion, is of course, to upgrade your computers to use new versions of Windows, the latest being Windows 8. But when I say easy, well, there will be some things to consider. Upgrading to XP to Windows 8 brings along a learning curve. Windows 8 being the third major release of Windows since XP incorporates a large number of changes to all aspects. Some of these changes were gradual, but some like the new user interface were sudden and quite large shifts in design. Your staff may need some minimal training to get up to speed with the new changes. Some of your applications may no longer work. Especially if you buy a new 64 bit computer, you may need a new version of the software. A case in point, earlier versions of MYOB worked fine on 32 bit XP and 32 bit Windows 8, but do not work on the 64 bit Windows 8. This requires MYOB to release a new version that works on 64bit Windows 8, and for the business to buy, the software . This can be a real problem if the vendor for an essential application has gone out of business, or no longer supports it. The cost of the upgrade. You will have to consider that it may be necessary to not only upgrade your software, but also your computer hardware, especially if your computers are more than six or seven years old. While Windows 8 works well on older hardware, ancient computers may not have enough memory to cater for Windows 8, and some drivers may not be compatible. This can be a significant cost burden for a small or medium sized business with one computer or two hundred. Like any good survivalist contemplating the fall of civilization, there are a few things you should do. Make a plan. Consider all your options. Pick the low hanging fruit and make the easiest changes first. Put your IT people on the job and get them to come up with an IT plan that covers all the bases. Can you upgrade some of your computers now? Do all of your computers need to use the old XP only apps? Upgrade those that don’t first. Make sure you have good virus protection. Since the biggest issue you will face in continuing to use XP is not receiving new security updates, your computer will become over time less secure. This can be mitigated to some extent by using third party virus and malware protection. We recommend Kaspersky at this time. It’s well worth the investment. Make sure you know where your disks are. The reason? It’s going to be harder and harder to find a genuine Windows XP operating system CD, if you need to reinstall XP on a new computer, because you have to keep your old applications around, well, it’s going to be difficult if you don’t have the disks. Do you really need those old applications? Do some research and find out if there are alternatives that run on later versions of Windows. Is there a cloud option? Your IT support should be able to help you here. Whatever you do, don’t rely on Microsoft to back away from shutting down support. A lot of people have surmised that the install base of XP is too large for Microsoft to just drop. The problem with this view is that the company is heavily invested in promoting Windows 8 and is unlikely to do anything that will retard its adoption. Dropping support for XP will encourage a move to Windows 8 despite it not being universally loved. The best thing you can do, regardless of if you are going to upgrade or not, is to be aware of the issues that you will face when Microsoft withdraws support for Windows XP in April 2014 and put into action a plan to migrate your computers to a new Windows at the earliest possible time. That doesn’t have be Windows 8 by the way, if you don’t want the baggage associated with Win 8, Windows 7 can still be sourced and used. If you haven’t given any consideration to these issues yet, perhaps the second best thing you can do is to call for help. Your IT people can help you here. Talk to them as soon as you can, April 2014 is quickly approaching.